The spectrometer on Cassini, the Cassini Plasma Spectrometer (CAPS) discovered a surprise: the ice particles are electrically charged. The CAPS instrument is designed to detect charged gas (plasma), but its measurements in the plume revealed tiny ice grains whose signatures could only be present if they were electrically charged. The particles have both positive and negative electrical charges, and the mix of the charges varied as the Cassini spacecraft crossed the plume. It was immideately theorized that the cause was that those ice plumes are "almost certainly" rooted in a subsurface sea of liquid water. EU although proposes a likely more realistic origin of that salts. As suggested for a possible electrical spark machining-mechanism of Mercury’s and Mars’s surfaces already the source and energies of sodium, potassium and other ions that have been detected in exospheres might be as well electrical. Chlorine and Sodium are strongly related in low-energy nuclear transformations of light elements by electrical sputtering. The newest information on the most recent Mercury flyby's detected surface "sputtering", sodium, calcium and magnesium in the exosphere, and they happened to fly through a "magnetic tornado" ( discharge vortex ) ripping ions from the surface. It seems likely that electric sputtering is the source of the salt and sodium bicarbonate on Enceladus as well. The question is, are those elements created by the electric sputtering, or are they present on the surface? Even if present on the surface, that doesn't imply a liquid ocean underneath, just that the frozen surface contains those elements in frozen solution. This image from Cassini shows a huge feature on Enceladus that looks just like a discharge vortex (tornado) in vertical cross section. So MESSENGER flew through and collected in-situ data on a discharge vortex, EDM event, and ongoing sputtering on Mercury, and here we see a blatant, 2-D sculpture, of a discharge vortex on Enceladus with in-situ data on sputtering from the "plumes". How much longer can mainstream scientists ignore this stuff? solrey wrote: How much longer can mainstream scientists ignore this stuff? This is a pretty fun little short story by Isaac Asimov "The Last Question" that got me thinking about a philosophical aspect of gravity cosmology. In that story mankind confronts the limits of entropy, it has only stars to use as fuel and stars have their own fuel. The sun's fuel will be used up, then the other stars, then all the stars. The gas tank starts on full and ends on empty. So if we apply the model to the plume on Enceladus, even if it's not in our lifetimes, that moon had better run out of water and the plume had better go away someday. Of course, if it's electric it doesn't have to stop until this solar system is no longer a discharge element in the galactic circuit, or this galaxy in the universal circuit. I can just see it, thousands of years from now, the last gravity theorist will admit they're wrong as the plume continues to exist even after all the water would be gone if Enceladus was merely a thin shell around a globe of water to begin with. A step in the right direction, just a leap of imagination needed in the sublimation process! I don't see it as a step in the right direction. We've used telescopes to see energetic polar jets spewing particles way out in these far-away galaxies... have we ever pointed similar telescopes with equal resolution to see if the 'jets/geysers/volcanoes' on these moons are likewise energized? Any why must water in the "geysers" be evidence of a liquid ocean? The powerful plumes, which contain water vapor, sodium and organic chemicals such as carbon dioxide, look a bit like the Old Faithful geyser in Yellowstone National Park. They have intrigued scientists because they suggest that a store of liquid water may be present beneath the moon's crust to give rise to the water vapor in the plumes. The Moon and Mercury both seem to produce their water locally at the surface or in the tenuous atmosphere. 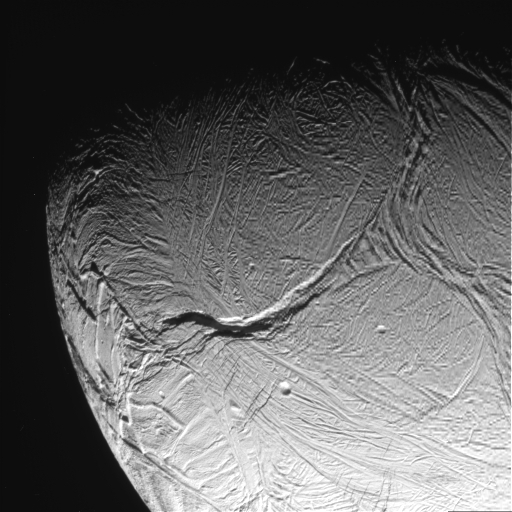 Why not Enceladus? What's good for the goose is good for the gander. Said as much in the comments. You know- i was thinking about how this article was written glancing back through here, and it occured to mei just how big a bunch of hypocrites that NASA and the Mainstream are! Speaking of Ol' Faithful- has anyone ever considered that the regularity of a geyser's eruptions might be an electrically-capacitive event, vs. a phenomenon that is strictly one of thermal regularity and geological dimensions? MH - I hadn't thought of that concerning geysers like Old Faithful, but if it's operative at that scale it could also be part of the driver for volcanism generally. Volcanism and geysers are not always as regular as Old Faithful, but there are some patterns with regularity, to a degree. The seismic activity along our Cascades out here has sort of a rhythm (and we're sort of due for another eruption, I read, but it's very indefinite). Interesting thoughts! I am wondering how they concluded that there was water vapor in the plume. I don't particularly dispute it, but if what is ejected were strongly ionized, it wouldn't be water vapor (gas molecules) it would be a plasma. On the other hand, it could be a weakly ionized plasma which is able to drag or induce molecular water with it. Or it may actually cool down enough to recombine into the gaseous molecular state some distance above the surface. Who knows? NASA is very parsimonious in revealing either raw data or what specifically they measured to come up with these conclusions. "Thou shalt brook neither argument nor discussion about it." It might have been the signature of OH radicals, again, which they call water because those combine to form water. NASA's Cassini spacecraft has sailed seamlessly through the Nov. 21 flyby of Saturn's moon Enceladus and started transmitting uncalibrated temperature data and images of the rippling terrain. These data and images will be processed and analyzed in the coming weeks. They will help scientists create the most-detailed-yet mosaic image of the southern part of the moon's Saturn-facing hemisphere and a contiguous thermal map of one of the intriguing "tiger stripe" features, with the highest resolution to date. "These first raw images are spectacular, and paint an even more fascinating picture of Enceladus," said Bob Pappalardo, Cassini project scientist at NASA's Jet Propulsion Laboratory in Pasadena, Calif. "The Cassini teams will be delving into the data to better understand the workings of this bizarre, active moon." Scientists are particularly interested in the tiger stripes, which are fissures in the south polar region, because they spew jets of water vapor and other particles hundreds of kilometers, or miles, from the surface. This flyby was scientists' last peek at the tiger stripes before the south pole fades into the darkness of winter for several years. The thermal imaging work focused on the tiger stripe known as Baghdad Sulcus. 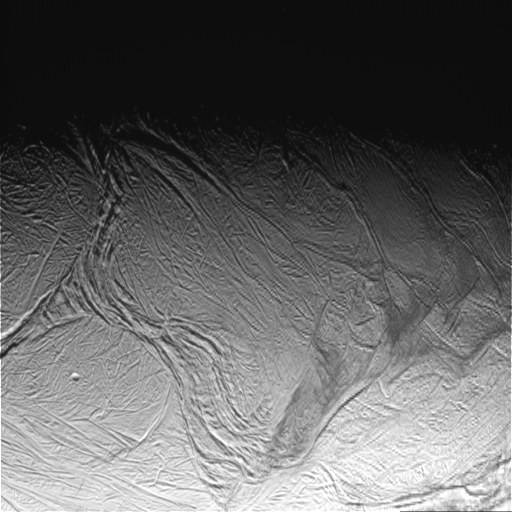 Raw satellite images of "Cassini Sends Back Images of Enceladus as Winter Nears"